Jaipur, March 23: Two days before the first game of the 12th edition of the Indian Premier League at the Sawai Mansingh Stadium between Rajasthan Royals and Kings XI Punjab, the stadium gates were locked as a result of a tussle between the Rajasthan sports council and the Rajasthan Cricket Association (RCA). The issue was resolved after talks between the RCA and the local sports council. Speaking to IANS, a senior Royals official said that it was nothing to be worked up about and the matter was resolved within half an hour. 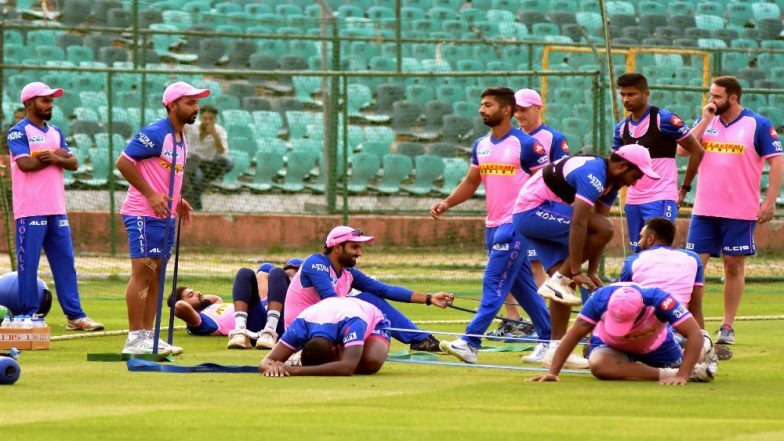 RR Squad in IPL 2019: Team Profile, Schedule of Rajasthan Royals in VIVO Indian Premier League 12. "Ajinkya Rahane and a few of the players wanted to go and train in the morning and they just had to wait for a bit for the gates to be opened. Took us hardly 25-30 minutes," the official said. VIVO IPL 2019: Rs 250 Crore Will be Spent by Three Brands on Aamir Khan in 40 Days - Read Details. Interestingly, IPL returned to the SMS stadium only last year after it was banned for four years by the Board of Control for Cricket in India (BCCI). The Royals are looking to start the competition on a positive note and Rahane feels that the return of Steve Smith to the team, after missing the previous season due to suspension, augurs well for the unit.